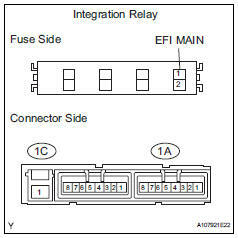 The efi relay is built into the integration relay (unit a: efi main). 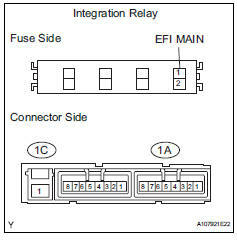 Some relays are built into the integration relay. The integration relay cannot be disassembled. If there is a malfunction in the circuit of the integration relay, replace the integration relay. Using a screwdriver, detach the 2 claws and disconnect the integration relay from the no. 1 Engine room junction block. Disconnect the 3 connectors from the integration relay. Check the resistance of the efi main fuse. 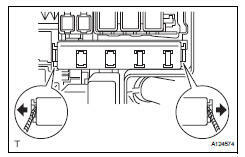 If the result is not as specified, replace the efi main fuse. Measure the resistance of the integration relay. If the result is not as specified, replace the integration relay.